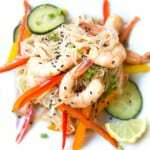 You’ll love this delicious Simple Sesame Shrimp Noodle Salad recipe. The bright, fresh flavors are ideal for the warmer months ahead. It’s perfect for lunch or dinner, and you can even make it the day ahead. I like to keep it really colorful with tons of crisp, in-season veggies. Mix things up by adding in carrots, zucchini, or cherry tomatoes (really, just whatever you have in the crisper drawer). Another way to modify this recipe is to vary the herbs used. I’ve also been known to swap parsley for cilantro because it needs the fresh herbs and I like parsley waaaaay better. Don’t be afraid to switch it up and make this Sesame Shrimp Noodle Salad your own! Try this easy and delicious Sesame Shrimp Noodle Salad recipe - it's perfect for lunch or dinner. You can even make it the day ahead! Whisk together the mirin, oil, Sriracha, tamari and 1 tablespoon of sesame oil in a large bowl. Add the sliced pepper, cucumber, onion matchsticks and shrimp and stir to combine. Cook the noodles in a pot of salted boiling water for 3-4 minutes. Rinse with cold water and drain, then toss with the rest of the sesame oil. Add the noodles and cilantro to the bowl of vegetables and shrimp, and stir to combine. Top with the sesame seeds and remaining green onions and serve! This entry was posted in Main Dishes, Recipes and tagged G-Free Foodie, gluten free, gluten free dinner, kc cornwell, noodle salad, Sesame Shrimp Noodle Salad, shrimp, weeknight meals. Bookmark the permalink.